So in the name of science (and in hopes of getting you through this article), let’s address our subject title first, because as it turns out, we are more bug than human, and accepting these little guys and understanding how to keep them happy is important to our health. The community of tiny microorganisms (bugs) living in our body is now commonly referred to as microbiota or microbiome. Over the past ten years, science has confirmed that the human body contains trillions of microorganisms outnumbering human cells 10 to 1. These little guys contribute more genes responsible for human survival than humans contribute! Genes carried by bacteria in the gastro-intestinal tract, for example, allow humans to digest foods and absorb nutrients that otherwise would pass through us. It’s not our bodies doing so; it’s the bugs in our bodies. However, it wasn’t long before the industry was buzzing about bugs. 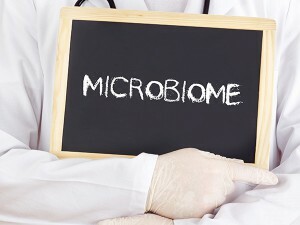 This is due mainly to the Human Microbiome Project (HMP), a consortium of 200 members from nearly 80 universities and scientific institutions launched in 2007 by the National Institutes of Health. Their astonishing results published in 2012 have both science and medicine rethinking common beliefs about what creates good health and what creates disease. “Like 15th century explorers describing the outline of a new continent, HMP researchers employed a new technological strategy to define, for the first time, the normal microbial makeup of the human body,” said NIH Director Francis S. Collins, M.D., Ph.D. The new technology referenced is recently developed genome sequencing methods which now provide a powerful lens for looking at the human microbiome. According to the NIH, the research produced numerous insights and even a few surprises. It was determined that nearly everyone routinely carries pathogens, microorganisms known to cause illnesses. In healthy individuals, pathogens cause no disease; they simply coexist with their host and the rest of the microorganisms living in the human body. In others, they wreak havoc causing disease and illness. So you can understand why keeping these bugs happy can contribute to a healthy body – and also why major manufacturers are jumping on the probiotic bandwagon. Probiotics are “good bugs” and are recommended for regular consumption (best from uncooked fermented foods like raw sauerkraut, sour pickles, kefir) and in supplemented, larger doses when taking antibiotics (which kill both the good and bad bugs in your gut). I sat down once again with Dr. Gundry who in October will present for the third year at the World Congress Conference on Targeting Microbiota at Institut Pasteur in Paris. As usual, Gundry proved to be ahead of his time, and I was curious to know when his interest in body bugs began. How do we get these bugs? We now know that our set of bugs comes from our mother who inoculates the baby as it comes through the birth canal. Organisms that don’t standardly live in the birth canal even migrate there prior to delivery to ensure the baby receives the large variety of microbiota needed for proper health. And we start feeding the baby bugs right away, says Gundry. 10% of breast milk has sugars called oligosaccharides that our body has no ability to digest, but our gut bugs require it. So this organism invests 10% of the calories going into milk not to feed the baby, but to feed the baby bugs who will eventually, of course, make up 90% of who that baby is. So what do the good guys like? According to Gundry, the good guys like soluble or fermentable fibers which are different from what most people think of good fibers. “Things like bran are insoluble fibers, and one of the worst things that you can eat.” Soluble fiber foods include artichokes, asparagus, mushrooms, avocados, blueberries, broccoli, and arugula. Also, resistant starches, which means that we can’t digest them, but our gut bugs “think they are See’s Candies.” He notes that cultures of longevity consist on diets rich (80%) in resistant starches (plantains, green bananas, jicama, taro root, yucca). • It can take over a year to restore your gut flora after one round of antibiotics. • Feel good hormones like serotonin are produced by bugs, so happy bugs make happy people. • There are no such things as antioxidant food, he says. Evidence shows that the bugs in your mouth eat all the antioxidants before they even leave your mouth, then produce the beneficial compounds that help us function. So it’s not the foods but what these foods do to the bugs. This revolutionary science is certain to change the way we look at medicine and health. In the meantime, learn all you can to honor your bugs and feed them well, because happy bugs equal a healthy body. For more information on the Human Microbiome Project, visit www.commonfund.nih.gov/hmp. For daily applications, Dr. Gundry recommends a user-friendly blogger named MrHeisenbug (“Respect the Microbiota”) or visit DrGundry.com. Yes, Dr. Gundry again leading the parade! Question, are cold white potatoes considered “resistant ” starch? Thank you, Ms. Reesa. According to Dr. Gundry’s food matrix, white potatoes are considered refined starchy foods and full of lechtins, so they should be avoided.